Chris Van Dusen writes: “I was born in Portland, Maine, on St. Patrick’s Day, 1960. As a child, my brothers and I would spend hours drawing pictures. We didn’t have video games or computers to entertain us, so we drew instead. One of my brothers would sketch intricate war scenes. Another would draw animals so realistic you’d swear they were breathing. My specialty was aliens, robots, and monsters. “Dr. Seuss and Robert McCloskey were my heroes. I loved the rhythm of Dr. Seuss’ words and I was fascinated by the meticulous detail of Robert McCloskey’s illustrations. I had no idea back then that I’d end up writing and illustrating children’s books when I grew up. “After high school, I studied fine art at The University of Massachusetts at Dartmouth and graduated with a BFA in 1982. It took me a while to figure out what I wanted to do. First I was a waiter, and then I was offered a part-time job at a magazine for teenagers. Eventually I started drawing cartoons and illustrations for the magazine and my career as an illustrator was born. “For more than ten years I worked as a freelance illustrator specializing in art for kids. I was doing mostly editorial work and my illustrations appeared in magazines like Nickelodeon, Family Fun, and Disney Adventures. One day I started thinking about drawing a picture of a boat stuck high up in a tree. I thought that would be a really funny and intriguing illustration. At the same time, a refrain kept running through my head—“Mr. Magee and his little dog, Dee / Hopped in the car and drove down to the sea.” The combination of these two things eventually became my first book, Down to the Sea with Mr. Magee (Chronicle), which was published in 2000. Since then I’ve written and illustrated A Camping Spree with Mr. Magee (Chronicle) (2003), If I Built a Car (Puffin) (2005) and I’ve had a ball illustrating Kate DiCamillo’s Mercy Watson series (Candlewick). “My contribution to Our White House: Looking In, Looking Out is the illustration of Teddy Roosevelt, who was one of my favorite presidents. 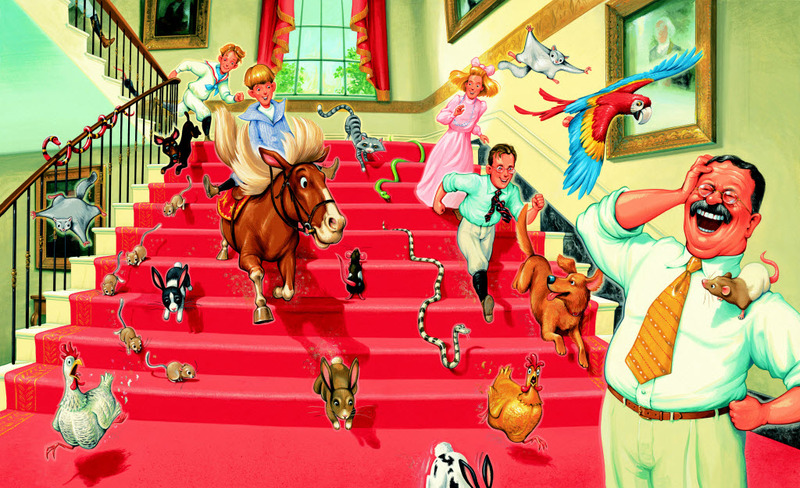 I knew he was a great environmentalist, but I was surprised to learn that he and his children kept so many pets in the White House. I could just imagine that TR would have found it quite amusing to be surrounded by so many animals, so that’s what I started sketching. Be sure to check out Van Dusen’s picture books The Circus Ship (Candlewick Press, 2009), If I Built a Car (Dutton Children’s Books, 2005), and Down to the Sea with Mr. Magee (Chronicle Books, 2000). 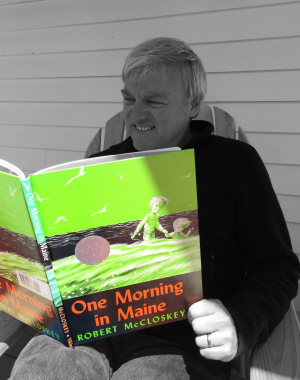 Chris Van Dusen recommends One Morning in Maine (Viking Press, 1952) by Robert McCloskey as a Great Read for ages 3 and up. Check out more Great Reads on thencbla.org.